Fields are a WIP, re-sorting Karp hunt? Karp hunt! Hey! I'm ObsidianMage, feel free to call me Obsidian or Mage. I promise I won't bite! I use she/her pronouns, please. New Kpop fan! I love Stray Kids, but if you have any recommendations feel free to let me know! I love all Pokémon, but especially Eevees! If you get a chance, head to my fields too! I try to click back 1:1, or I'll click an Evolve field for you. :) My fields are mostly stacked and sorted! Pokérus x12! If you play Flight Rising, hit me up- happy to chat about dragons! 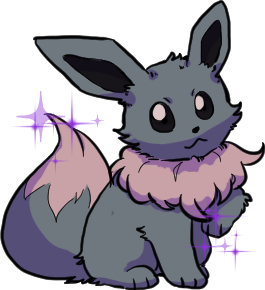 Crazy goals of mine: Have all Eevee evolutions. BUT. Mega, as well as Mega+Shiny, and if I'm truly crazy, Mega+Albino. Not insane enough for Mega+Melan. Another goal: Upgrade all my gemwish items! Currently working on Normal for my Eevee hunt. And somehow I hatched this guy during my Eevee hunt?